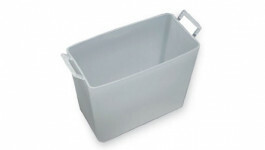 Disposable solvent resistant polypropylene container for the 12-Positions manifold. These waste containers greatly simplify sample preparation, solvent disposal and clean-up. Depending on the nature of the solvent used, the waste container can be reused many times prior to discarding. Note: Waste containers not available for the 24-Positions vacuum manifold.